In addition to the annual Winter Classic, this year taking place on January 2nd, the NHL will celebrate its 100th anniversary with an additional outdoor contest. Putting two of its oldest franchises head to head, the puck will drop for the Centennial Classic at Exhibition Stadium in Toronto on new year’s day. The Leafs and Red Wings goaltenders have kept their masks for the game under wraps until the final hour, but here’s our breakdown of what we’ve seen so far. Keep checking back as we break down the rest of the masks as they’re revealed! The Centennial Classic is not just another outdoor game for the NHL, but a celebration of 100 years of history. Acknowledging and paying homage to that milestone is Freddie Andersen’s mask for the game. Painted by airbrush wizard Dave Gunnarsson, Andersen’s blue and white mask is packed with portraits of Leafs past, almost like a miniature hall of fame in bucket form. Using a standard paintbrush with white ink on a blue backdrop, Gunnarsson artfully executed portraits of ten goaltenders; Johnny Bower, Turk Broda, Curtis Joseph, Terry Sawchuk, Mike Palmateer, Harry Lumley, Ed Belfour, Felix Potvin, Lorne Chabot and George Hainsworth. The left side of the mask boasts a large Maple Leaf with chrome detail to tie in with the silver accents on the Leafs’ jerseys. A true nod to the products of the motor city, Mrazek’s mask is shiny and silver all over, featuring shredded, oversized metal wings on each side and the event logo subtly in the center. “A lot of silver paint in my airbrush guns,” Gunnarsson confessed. Good luck getting rid of all that glitter, Dave! 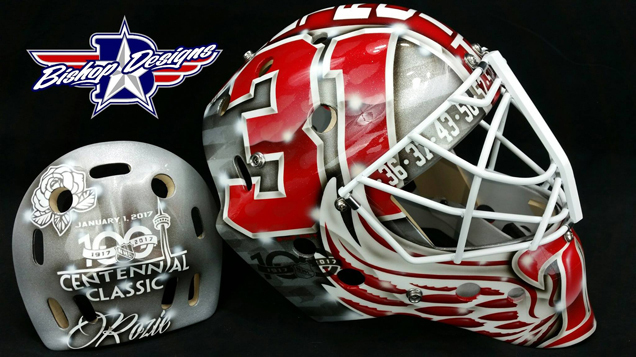 Like Gunnarsson’s take for Mrazek’s mask, artist Ray Bishop took a similar approach in crafting Jared Coreau’s bucket for the Centennial Classic. Opting for a primarily silver color palette, Coreau’s mask features the event logo on the backplate with his number 31 in large red letters on each side. The Detroit “D” logo is on the chin, framed by two wings hovering over ghosted Centennial Classic logos on the sides. The years of the Wings’ numerous championships span across the front of the mask, partially hidden by the stark white cage. What do you think of this year’s Centennial Classic masks? Let us know in the comments, or on Twitter or Facebook!